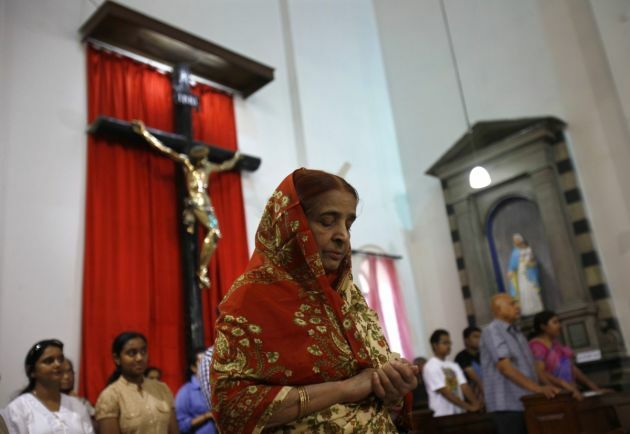 (Photo: REUTERS / Mansi Thapliyal)A woman attends a mass inside a church on Easter Day in New Delhi March 31, 2013. Holy Week is celebrated in many Christian traditions during the week before Easter. Christians in some states of India are reporting an increase in the number of attacks on them by Hindu extremists who are adamant that none of their believers should convert to any other religion. The Britain-based group Release International has reported on the increase of attacks against Christians as existing anti-conversion laws are hardened to prevent Hindus reverting to another faith. Release is a member of the UK organizations Global Connections, the Evangelical Alliance and the Micah Network. It is running a petition calling for religious freedom in India, is condemning a controversial new anti-conversion law and it will present it in November to the High Commissioner (Ambassador) for India in London. "We, the undersigned, are gravely concerned and disappointed by the Indian Government's failure to protect the religious rights of Christians in India as outlined in the Indian Constitution. "The Right to Freedom of Religion, covered in Articles 25-28, provides religious freedom to all citizens and ensures a secular state in India," says the petition. It points out that according to India's Constitution, there is no official State religion, and the State is required to treat all religions impartially and neutrally. The constitution guarantees all persons the freedom of conscience and the right to preach, practice and propagate any religion of their choice. "However, Christian pastors and evangelists, notably in the rural areas of Karnataka and Andhra Pradesh, are frequently attacked by Hindu extremists and then detained by police on false charges of 'forcing people to convert.'" In May Release chief executive Paul Robinson said, "Hindu nationalists have been open and violent in opposing the Church whether through direct physical attacks on pastors and evangelists or falsely accusing Christians of forcing Hindus to convert to Christ." Release said India's Madhya Pradesh state has taken steps to make its existing anti-conversion law even more restrictive, effectively overturning the religious freedom guaranteed under India's constitution. "The Bill requires anyone wanting to change their religion to first seek official permission. It obliges religious leaders to report conversions, and mandates a three-year jail sentence for failing to do so. That rises to four years in the case of a minor, a woman or a Dalit (untouchable)." The petition noted that the bill, passed by the state's legislative assembly on July 10, has yet to be signed off by the governor. "The new law represents a significant hardening of official attitudes towards religious freedom," says Release. A total of seven Indian states have passed anti-conversion laws said to stem from pressure by Hindu extremists who support Hindutva. This is an ideology of "one religion, one language, one nation." Based on the belief that to be Indian is to be Hindu. The conversion of Dalits, people who have been referred to as out-castes, or untouchables, and who are beyond the caste system is a flashpoint for some Hindus. Extremist Hindus view Christian ministering to Dalits, many of whom have turned to Christianity, as an affront to their culture. Attacks against Christians are increasing, according to partners of Release International, which supports the persecuted Church around the world. "Attacks on Christians in India are definitely increasing," says Joseph D'Souza, the president of the All India Christian Council. "'These attacks take the form of physical violence, destruction of churches, false cases and arrests." "Release International is deeply concerned about the rise of Hindu extremism and the growing culture of religious intolerance in India." said Release's Paul Robinson. 'We will be presenting a petition in November calling on India to uphold the religious freedom guaranteed under its constitution." Hindus account for about 80 percent of India's 1.2 billion people while there are more than 60 million Christians who are a tiny minority of about 2.3 percent. Muslims make up just over 13 percent of the country's population.